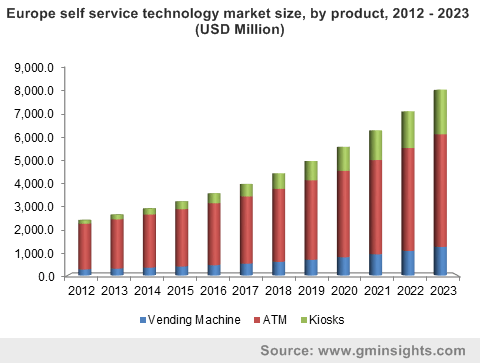 Self Service Technology Market size was USD 16.06 billion in 2015, and is forecast to exceed USD 42 billion by 2023, at 13.2% CAGR from 2016 to 2023. Changing consumer preferences and an innovation-led competitive landscape will drive sales. Real-time notifications via cloud-based networks for remote management and enhanced security are also expected to fuel global self service technology market size. Growing inclination towards mobile transactions as well as increased automation and demand from the retail sector will favorably impact revenue in the coming years. Proliferation of NFC devices and reinvention of traditional product offering are among major drivers for the kiosk market size. These internet-connected shopping assistants help understand shopper behavior and support social media activity while helping customers organize lists, consider ideas, locate merchandise, and pay for merchandise. Rising adoption of biometrics and telehealth coupled with multi-function, light weight, low cost device demand will aid in self service technology market growth. Several healthcare facilities are deploying kiosks for offering their patients an enhanced experience. These devices allow patients to check-in for preregistered appointments, update demographic information, review insurance information, scan ID and insurance cards, make credit card payments, and sign consent forms with an electronic signature. Increased security, cashless systems, anti-theft cameras, speech processing, and remote management has revolutionized the industry. Improved user interface and stringent regulations such as government mandated nutrition labeling in North America which helps consumers identify nutritional features about a product is a strong driving force for the intelligent vending machines market. Concerns regarding data security may restrain growth. Vendors encounter impediments such as poor transparency, specific labor requirements, technology transfer, and joint venture requirements, which have an adverse effect on the nature and scope of their operations. ATM Market Size was over USD 12.5 billion in 2015. Manufacturers are now opting for anti-skimming voice recognition systems and biometric devices in an effort to reduce fraud in the ATM space. Cloud-based technology used by wireless devices helps in minimizing financial frauds. Enhanced security standards will foster self service technology market growth. Global kiosk market size is forecast to witness growth over the forecast timeframe, with over 25% CAGR estimations from 2016 to 2023. Companies are also developing face recognition features to help and identify users and provide enhanced customer support. Increasing competition in the banking sector has attracted players to improve transactions, cheque deposition and querying, in order to provide more convenience to the customer. U.S. self service technology market share contributed to majority of the North American revenue. Increasing consumer acceptance and growing usage of single-function tablets or smartphones across numerous applications areas will be responsible for growth. Asia Pacific vending machines market size is poised to grow at 21.7% CAGR from 2016 to 2023. Major trends across key countries such as India and China include rising customer demand for self checkout, smartphone apps, and intelligent IVR systems. Product obsolescence owing to the development of new innovative devices with value added features may pose a challenge to industry participants on a global scale. With growing outsourcing activities, customer data are being migrated to off-premise data centers, which cannot ensure direct supervision. Retailers have adopted wireless technologies and tend not to engage in data encryption, which present low degree of security compared to wired counterparts. Diebold, GRG Banking, NCR, Wincor Nixdorf, and Euronet Worldwide accounted for more than 50% of the self service technology market share in 2015. Development and introduction of new products are among the major growth strategies employed. For example, Diebold launched a series of ATMs equipped with features such as security camera provisioning and biometric finger-vein readers. The company also introduced card readers that are aimed at high degree of security since they prevent card skimming. Other major players include companies such as Fujitsu, Crane Corporation, Hitachi, etc. that provide machines as well as managed services as part of their portfolio. Euronet acquired cloud-based financial services provider Pure Commerce in order to expand to other regional industries and increase their customer base. The self service technology industry comprises various manufacturers of components such as cash dispensing devices, biometric authentication, card readers, anti-skimming devices, slip dispensing steel rod, etc. Collaboration with component suppliers encourages innovation for developing more sustainable products for the end users. Software suppliers such as independent software developers provide application server solutions, mobile platform, software development kits, and middleware platform. In order to provide seamless service, efficient working of these machines is essential. Transaction management and overall functionality is often handled by a third party. For instance, in case of the brown label ATM market where banks outsource operations and management activities, third parties in collaboration with financial institutions manage cash for the bank’s onsite or offsite machine location. With remote monitoring solutions, product management is possible in a cost effective way.